Rich results are visually appealing, and make it easier for users of your module to ‘parse’ and understand the results your module produces. A lot of people find statistics challenging, so we might as well make them as accessible and easy to read as possible. This is pretty similar to the ttest.a.yaml file; there’s a name, a title, and a jamovi results spec (jrs) (note, this is different to the jas in the .a.yaml file). items comes next, and it describes all the items that make up the results. For example, the results could be made up of two tables and a plot. Each item in the results is listed here. Now you can see where this seemingly arbitrary name text came from. This is how different results items are accessed. Let’s add a table for our t-test results. For the time being, we’ll leave the existing ‘Preformatted’ results item and add the table underneath. This will let us check that the results we populate the table with are correct. 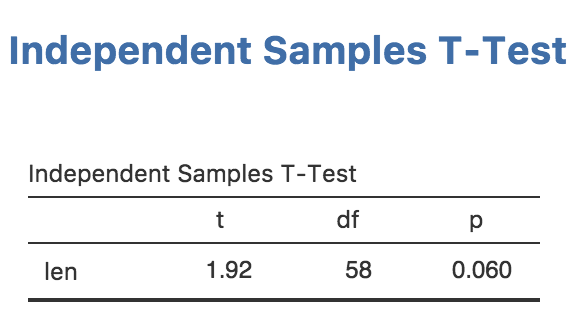 With these modifications, we’ve added a new table called ttest with the title Independent Samples T-Test. We’ve also specified that it is to have 1 row, and that it has four columns; var, t, df and p. Notice that we’ve specified an empty string for the title of column var. If a title isn’t specified the column name is used instead. The type for each column is specified as either text, number or integer. The type affects the way the column is formatted. text columns have their content left aligned, number and integer columns have their content right aligned. integer columns are formatted as whole numbers (no decimal places). The format field is a string of comma separated values. It provides additional information on how a column should be formatted. 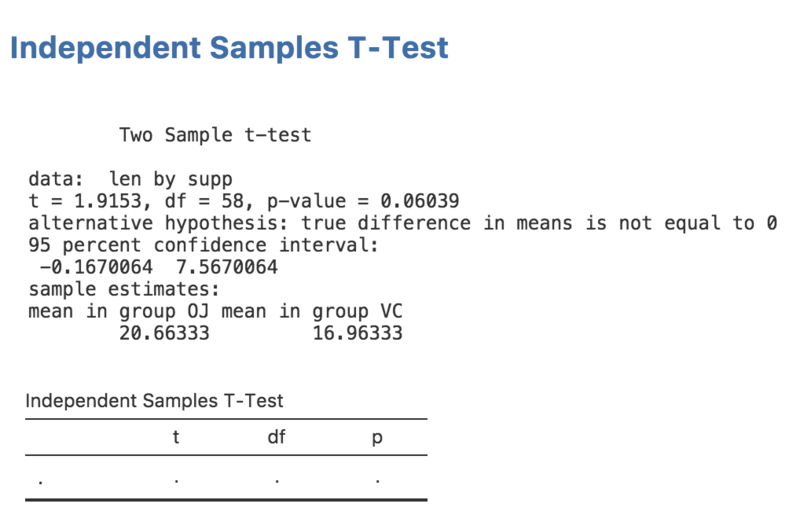 In the case of the p column, it has two formats applied, zto and pvalue. zto indicates that a value ranges between zero and one; this causes it to be rendered to a fixed number of decimal places. In contrast, values without this format are formatted to a fixed number of significant figures. This makes the biggest difference with values close to zero; without zto the value 0.006 would be rendered 0.00600 (3 significant figures), where as with zto it would be rendered 0.006 (3 decimal places). With values like correlation co-efficients and other values which range between zero and one, the latter is generally preferred. 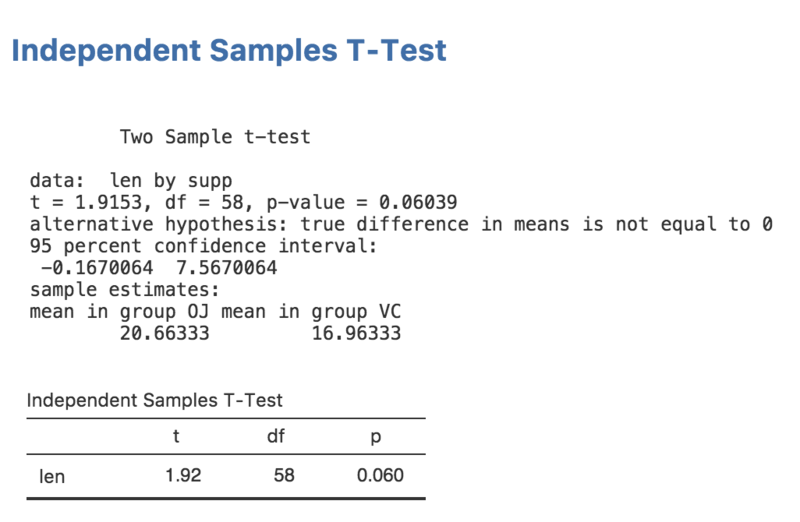 The other format is pvalue, which indicates that values in this column are p-values. If any of these values drop below a threshold (.001 by default), they will be replaced with < .001. ##  "statistic"   "parameter"   "p.value"     "conf.int"    "estimate"
##  "null.value"  "alternative" "method"      "data.name"
With a little more tinkering we can figure out that results$statistic contains the t statistic, results$parameter contains the degrees of freedom, and results$p.value contains the p value (that last one probably didn’t require that much tinkering). then perform a reinstall with jmvtools::install(). Now we have a nice, attractive, minimalist t-test. As can be seen, a nicely formatted table has been generated in R as well. Everything is maintained, right down to the number of decimal places. In this way jamovi can make R packages — even if you have no intention of publishing as jamovi modules — more attractive, easier to read, and more consistent too.